Villa Angevic is a 4 bedroom property located in the charming resort of Moraira with a few shops, bars and restaurants within 5 minutes' walk. The centre of Moraira, along with its beach and restaurants overlooking the beautiful marina is just a few minutes' away by car. The villa has an inviting private pool, and spacious covered terrace with table and chairs plus a seating area for alfresco living. WiFi, pool heating and air conditioning/heating in the bedrooms are included. Ideally located in Moraria with restaurants and bars just a 5 minute walk away! The private, pool is surrounded by sun loungers, where you can relax with a cool drink and work on your holiday tan. On the adjacent covered terrace is a dining table and chairs, as well as chill out seating area. There's also small pergola by the pool with a decorative, stone dining area. The brick BBQ with handy preparation area and sink is at the front of villa so you'll be well equipped for dining alfresco in true Spanish style. Entry from the lane is via large gates onto a private driveway for several hire cars. There's a large terrace at the front of the villa with a small wicker table and chairs, plus seating area from which you can enjoy views of the surrounding area. The main entrance opens into the lounge/dining area. There's a comfortable open plan lounge/dining area with ample seating, an ornate feature fireplace, flat screen TV and a dining table and chairs. You'll have direct access onto the spacious front terrace. The fully equipped kitchen with adjoining laundry room is adjacent with all you need for preparing family meals, as well as a small table and chairs. On the ground floor there is a twin bedroom with a separate bathroom adjacent. The remaining bedrooms are upstairs, comprising of 2 twins and a spacious double with it's own balcony with plenty of space to sunbathe. There is a large, separate bathroom completing this floor. This villa is registered and licenced by the Generalitat Valenciana to comply with local legislation on holiday rentals. This number is: AT-423910-A. This villa is located in Moraira, less than 5 minutes' walk to a small shopping parade with a supermarket, bars and restaurants. The centre of the resort, fabulous marina, Ampolo Beach plus places to eat and drink is just a few minutes' drive or 20 minutes' walk away. If you wish to explore a bit further Javea is 20 minutes' drive away. 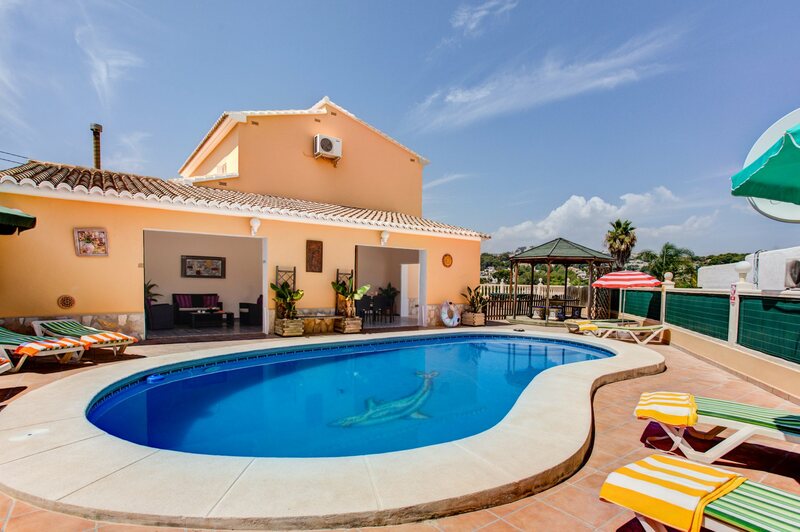 This villa is situated on a side street next door to our villa Caseta Blanca. There is an open-air market on a Friday morning in Moraira selling local produce so why not stock up for a BBQ back at the villa? You can also find boutique style shops in the lanes of Moraira. For your daily essentials the supermarket a few minutes' walk. In Moraira there are restaurants and beach bars where you can sample the local cuisine. Why not stop and enjoy a dip in the sea followed by lunch at a Chiringuito? Alternatively, the beautiful marina is the best place to sample the local catch of the day. The sandy Ampolo Beach is in the heart of Moraira, a few minutes' drive away with a beach bar just behind it, which is a great place for dining overlooking the sea. There are many coves and smaller beaches in Moraira, with El Portet offering a sandy but small beach with cafes and restaurants behind. It's considered an exclusive area and many boats and yachts come to drop anchor in the aqua marine coloured waters, so a great place to people watch too. There is something for everyone in and around Moraira including go-karting and pedalo hire. There is a variety of water sports on offer, or perhaps relax playing boules under the palm trees just behind the sandy beach in Moraira. A static fairground located by the market offers fun for the little ones, and for the adults there are a couple of small nightclubs, one of which is open air. Javea and Calpe are the next towns surrounding Moraira, with Calpe famous for its Ifach rock and fish restaurants. If you fancy a day out in Benidorm, its only 45 minutes' drive away with plenty of attractions like to the Terra Mitica theme park and waterparks. For a full day out try a trip to either of the historic cities of Alicante or Valencia. Why not try a day out in the ice cool waters of Guadalest, climb the tower, enjoy a spot of lunch and watch or join in as the people jump off the rocks into the water below. Villa Angevic is not available to book for season as it is sold out. Take a look here at the Costa Blanca villas that are currently on sale.